The first thing you need to understand about the 20 trillion dollar banknote, is the fact that 20 trillion is a significantly large number. And for a country’s currency to have a 20 trillion dollar note, is a sign of severe hyperinflation. 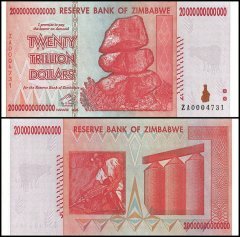 The 20 trillion Zimbabwean dollar banknote is considered defunct currency now and is reminiscent of the days when the Zimbabwean dollar was subject to first severe inflation and then hyperinflation. The Zimbabwean dollar was the official currency of Zimbabwe between the years 1980 and 2009. During those years, the Zimbabwean dollars saw the worst inflation and hyperinflation in history. The hyperinflation reduced the Zimbabwean dollar to the lowest valued currency in the world. During this time, the currency was denominated three times. The third denomination introduced the 100 trillion-dollar banknote, which at the time, was not even enough to buy a bus ticket. When it was denominated a fourth time, the dollar's worth dropped to the lowest ever. The Zimbabwean dollar was the successor to the Rhodesian dollar which was equal to half a pound sterling. The name “Zimbabwean dollar” was selected because the value was closer to the US dollar than to the pound sterling. The 20 trillion-dollar banknote was the rarest of the Zimbabwean banknotes with very few actually printed. After the abandonment of the Zimbabwean dollar in April 2009 and the demonetization of the currency in 2015, the trillion dollar banknote especially the very rare 20 trillion-dollar note, has become hot property for banknote collectors all over the world. It is interesting to note that during its existence the 20 trillion dollar Zimbabwean banknote was at times not enough to buy a dozen eggs and now is now considered a big investment. Soon, this bill will become a unique artifact that will be the pride of any owner’s collection.